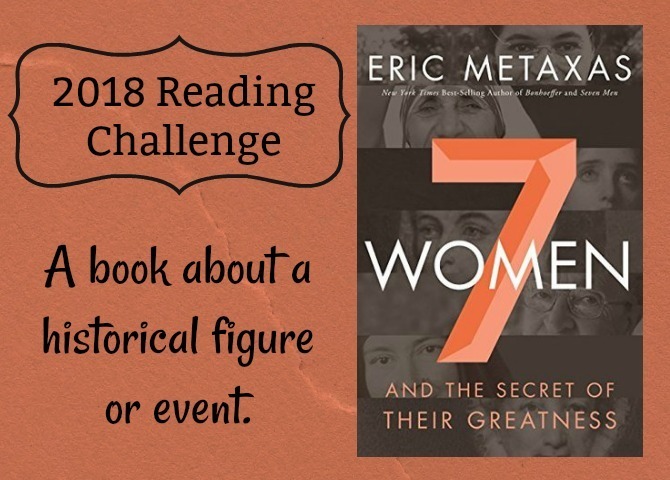 2018 Reading Challenge: A book about a historical figure or event. Biographies—and really all books within the history genre—are definitely an area that is lacking in my my reading life. It’s not that I don’t enjoy learning about history; both of my parents are pretty big history buffs and they taught me to appreciate the subject from an early age. However, I’ve had the most luck with historical fiction, as I find many nonfiction history books to be pretty dry. I always end up enjoying (or, at the very least, learning a lot from) the history books that I do read, but I need to be in the right mood to pick them up. 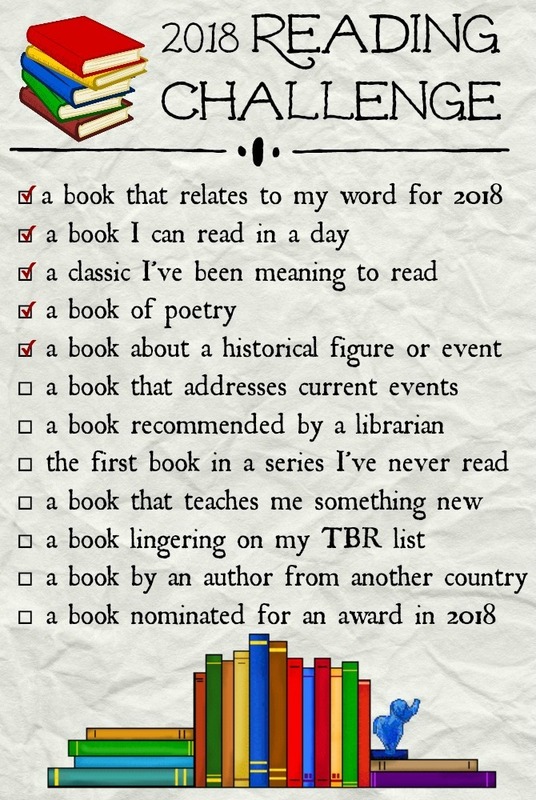 Including this category of books in this year’s Reading Challenge was my way of nudging myself toward the genre, regardless of my mood. A goal for including this genre in my year’s Reading Challenge was to do some in-depth learning about a single person or event. . . so I suppose I cheated a bit by selecting a book about not one, but SEVEN people. This book has been on my radar for a while, though, and when the Kindle version came on sale for under a dollar the very week I was selecting my next Reading Challenge title, it seemed like too much of a coincidence to pass up. Eric Metaxas is a seasoned biographer best known for his works on Dietrich Bonhoeffer and William Wilberforce. 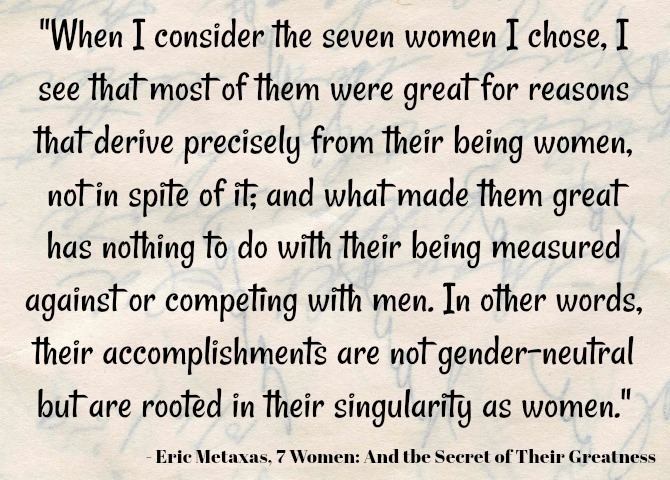 In 7 Women: And the Secret of Their Greatness, Metaxas explores the lives and achievements of seven women who changed the course of history: Joan of Arc, Susanna Wesley, Hannah More, Maria Skobtsova, Corrie ten Boom, Rosa Parks, and Mother Teresa. Each of these women is deserving of her own complete biography, but I enjoyed getting a bird’s-eye view of their lives and accomplishments, and the ways they contributed to society. Metaxas begins with an introduction outlining his reasons for selecting these specific seven women for his book. After writing 7 Men: And the Secret of Their Greatness, he’d received many requests to write this book, and of course his fans had ideas about who would be included. Many of the suggestions were women who had been the first of their gender to do something men had already done, such as Sally Ride or Amelia Earheart. 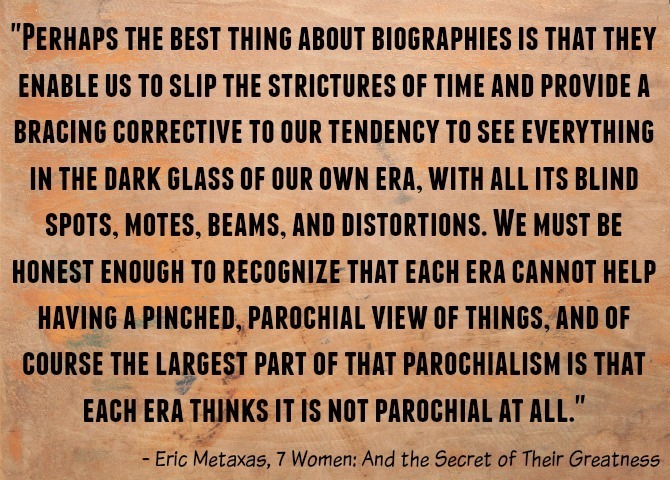 However, Metaxas didn’t want to write a book that pit the sexes against each other. The great men in his first book had not been measured against women, and he did not want the women in this book to be measured against men. Instead, he selected women who were great, not in spite of their womanhood, but because of it: it was their specifically feminine attributes that empowered them to do such amazing work. I loved Metaxas’ perspective and am fully on board with his view of feminism—that men and women were designed by God to be different, and we need to celebrate these differences rather than pretend that men and women are exactly the same. The rest of his Introduction explores this theme further, and it was by far my favorite part of the book. The seven women whose stories are told here are not the seven women I would have selected, but only because I had never heard of many of them! Corrie ten Boom has been my personal hero for decades (and her inclusion was the book’s biggest draw for me), and I was familiar with Rosa Parks and Mother Teresa, but the remaining women’s stories were all new to me. Having read them, I now have many more heroines to add to my list of personal role models. 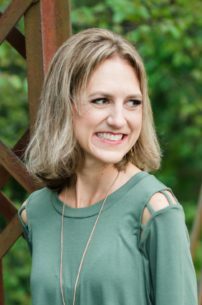 The seven women are incredibly diverse, coming from different decades, different faith backgrounds, and different life circumstances. But each was used by God to do incredible things, whether that was playing a role in the abolition of slavery, showing love and compassion to the sick and dying, or leading an army to victory. Because this book consolidates the stories of seven women into a single tome, it is light on anecdotes and heavy on dates and other basic facts. As a result, it isn’t the most engaging read. However, I appreciated the compilation: together, this group of women presents a powerful picture of how God has used women throughout history. And getting a taste of each woman’s story has inspired me to read more about each one of them. 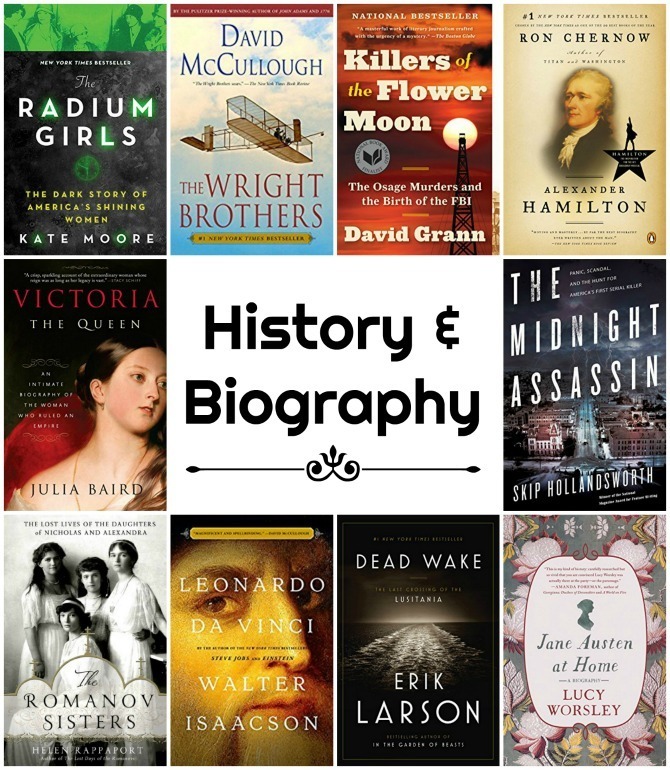 Do you read a lot of biographies or other history books? What’s your favorite book from the genre? What would you have chosen to read from this category?